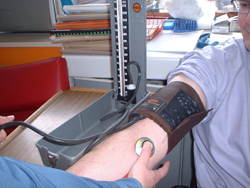 The Elburn & Countryside Fire Protection District provides free routine blood pressure checks to the public at all fire stations Monday through Saturday between the hours of 7 am to 4 pm. The times listed above should serve as a guide for routine blood pressure checks. However, they should not prohibit any person from going to a fire station and requesting a blood pressure check during other hours. As always, anyone suffering a medical emergency should access 911 regardless of the time. High Blood Pressure (hypertension) is often called “the silent killer”, because symptoms are often not apparent. Take advantage of this free service, and stay healthy! Please contact the Fire Department for more information.